I have travelled quite a bit in India but prior to my Smartphone and Maps nirvana, I used to ask for directions frequently. I did my PGDM (MBA equivalent) from a place called Harihar, 260 odd Kms away from Bangaluru in 2001-2003. That was my first proper induction to the Southern part of India. I did not know the culture, language and least of all, places. I used to take my Hero Honda Splendor (yes, I had my mobike there) to Harihar and Davengere, Ranebennur etc on off days. I would often get lost in the streets, rely on the hand directions of locals and would zoom off in that direction with the hope that the road would take me back to my institute. I never doubted the directions. It has been a way of life for us Indians because the cities and the towns are mostly unplanned, growth unabated has taken off whatever little familiarity you might be having with that city/town you are in but not belong to. Then from 2007, I started using Google Maps and late 2008, started using Ovi Maps simply for the fact that more cities were added and there was voice navigation. Then I had a fantastic solution. There was sync between Google Maps and Ovi Maps. 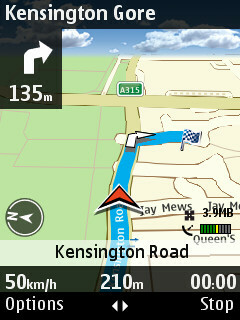 Search the location on Google maps, save it as a favourite and navigate through opening favourites in Ovi Maps. It would always be available. For some reason unknown to lesser mortals, this syncing of favourites was barred. 2009 onwards, I started depending totally on Ovi Maps and it has been a loyal companion ever since. I stopped asking people for directions. I would ask, ONLY if that location was neither on Ovi nor on Google. I would double check with the Maps. The point I am trying to make is very simple, technology has gained more trust in my life than relying on people for directions. I never noticed this and never realized this and never acknowledged this until this little incident happened in Goa. For those uninitiated, I work for a company and Goa falls under my territory of work. I make a visit every month there for work related purposes as it is the city of focus for my organization for 2011. I go there for a week. I get free by 5.30 and then I am on foot, roaming Panjim. Sometimes, I will take a bike on rent and go to Madgaon, just like that. During one such wander of mine in Panjim, I came across one lady who was looking a little disturbed. Now, mind you, I am not the types who would run to help a woman in distress. (So much so for the Chivalry!) Before you jump the guns, let me clarify, people seriously doubt the intentions, especially if you volunteer to help a young lady! I showed her on map the location and her location. The blue line of navigation worked wonders! She could actually see how close she was standing to her hotel and how easy the route was. She thanked me and went her way. I infact took a U turn and bided some time so that she would not think that I was stalking her! Come back to Davengere and Ranebennur trips paragraph. How easy it was to trust people for directions earlier. How difficult it is now? I could give the direction is crystal clear communication, still she was not sure. I showed her the Maps on my phone and she simply trusted the route and went that way! I was happy I could help someone. But it seriously got me wondering, you trust electronic maps more than a human standing next to you and giving you the directions. How long before you start trusting virtual friends more than the real ones?? Hope you received the link in mail. This entry was posted in Musings on my life, Musings on Services. Bookmark the permalink. 2 Responses to Times are a changing! Times Change; Technology Changes; but people Change less!! I think people tend to hold on. hold on to past, hold on to memories, hold on to practices. Updation requires learning, letting go of what they know to do best and this overpowers the human brain to adapt change. That gets shielded under nostalgia, good old days whatever. Not every change may work but it sure is worth a try!